That day things worked out, but they could have just as easily been much much worse. 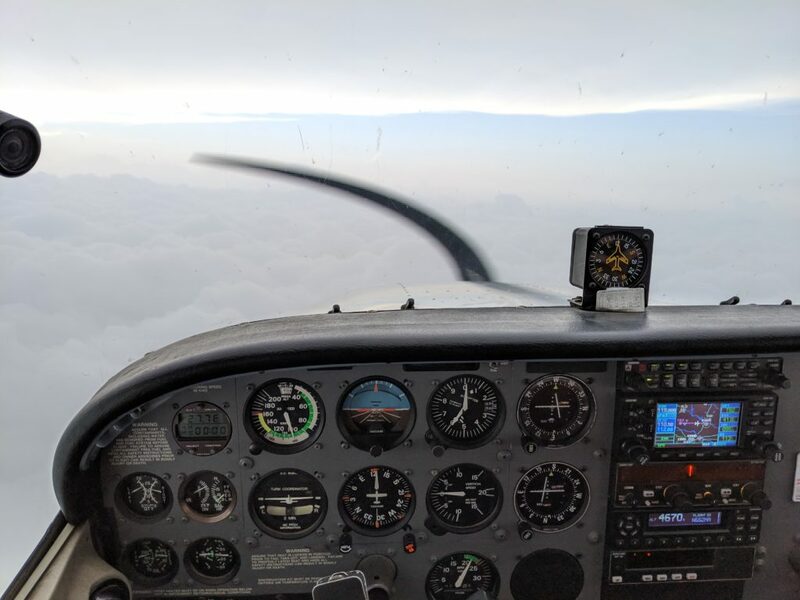 One such scenario was recently highlighted in an AOPA Air Safety Institute video about another pilot who suffered a complete power loss mid-flight in IFR conditions. We like to think that because we have redundant sets of in-panel radios and a power source that’s backed up by a rather chunky battery these things won’t happen to us. But the reality is that systems break and fail, and having a backup readily available that is a completely isolated system could mean the difference between life and death. And, for those times when it isn’t a “life critical” item, it can help pilots get their ATIS information and pick up their IFR clearances without spinning the engine, saving some gas in the process. I don’t usually get to indulge multiple aspects of my nerdiness in one review, but here I’m speaking as more than a pilot. As a Licensed General class amateur radio operator and former president of the Penn State Amateur Radio Club, I’ve fondled more radio gear than most sane individuals and bounced radio signals off the moon using little more than the metal railing in a building stairwell. First things first, a little bit about legality. As a shared natural resource, access to the radio frequency spectrum is regulated by the government. 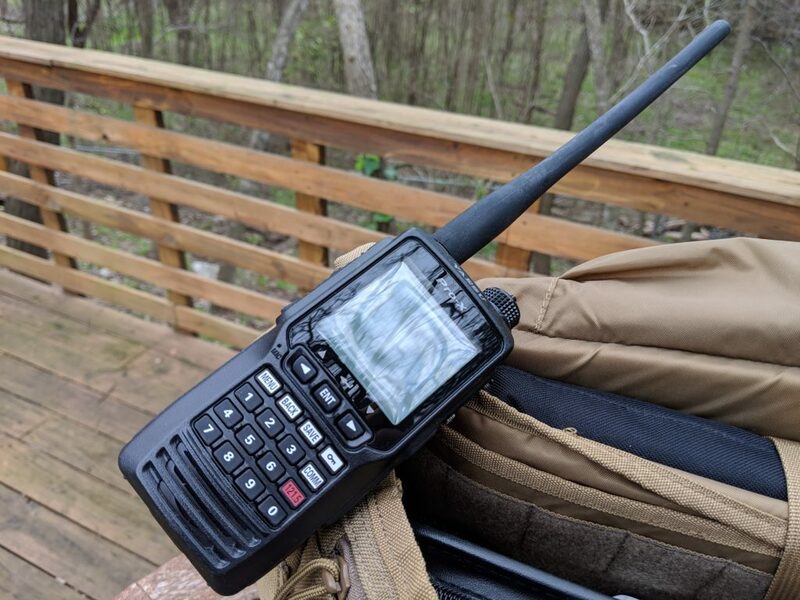 Some parts of the spectrum don’t require a license to use (like CB Radio, GMRS, and FRS), but other parts of the spectrum are freely available to listen and require proper licensing (like amateur radio bands) to transmit. Others (like cell phone frequencies) are illegal even to listen to. The most common form of radio is a “”scanner” that is only capable of receiving and not transmitting radio signals in these bands. 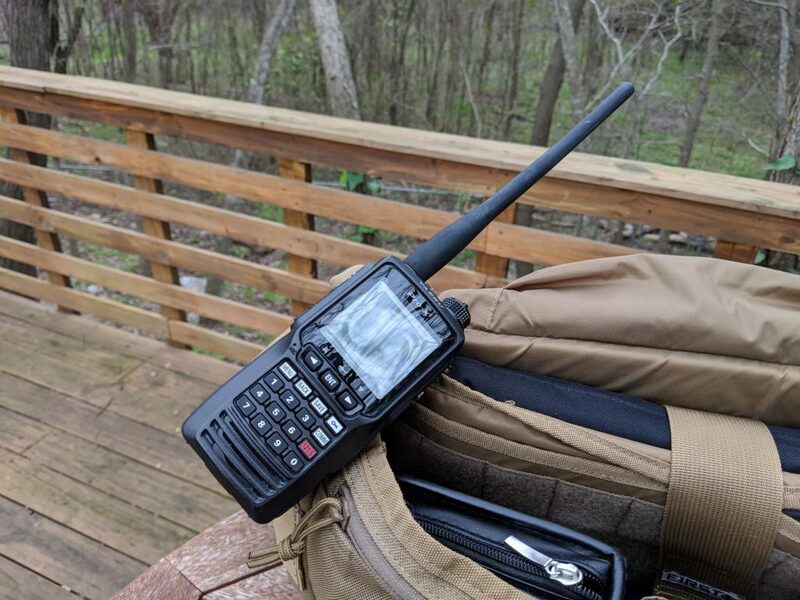 There’s a common misconception that a license is required to buy radios that are capable of transmitting on amateur radio or aircraft bands — in reality you can purchase these radios many places online without anything more than a credit card, but how you use it is the difference. When it comes to manufacturers I usually fall into the Icom fanboy category, an Icom T-90A being my first handheld radio. But in this case the Yaesu model was $100 cheaper, and came with an added benefit that I’ll get to in a second. The radio is constructed of a durable plastic case surrounding the delicate electronics. 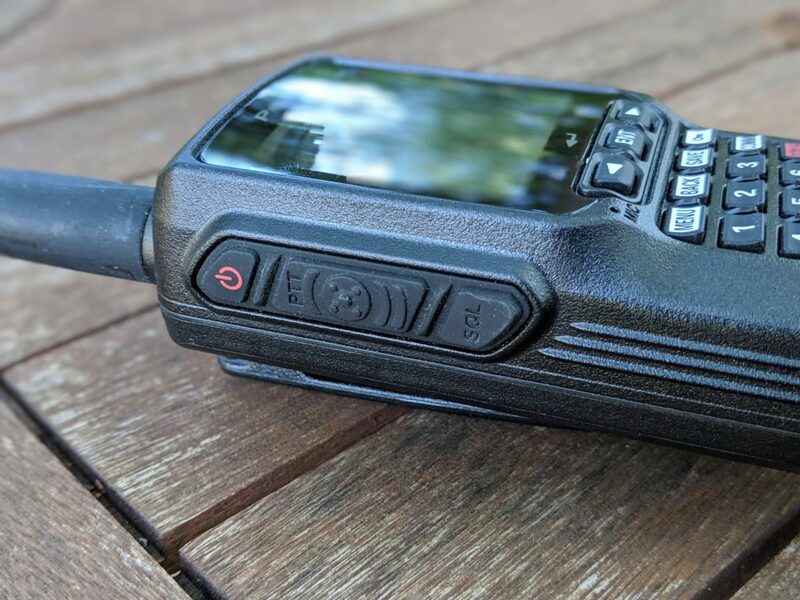 The radio is even certified to meet IPX5 waterproof standards, meaning that it can survive sustained spraying of water without malfunction — something handy in poor weather. On the front of the radio is a very large black and white digital display, which is easy to read even in a busy cockpit and offers a selection of pre-programmed frequencies that pilots can enter. Below the display is a number pad to easily enter frequencies, navigation buttons for the on-screen menu, a “lock” button to keep accidental changes from being made, and a red 121.5 button that offers one-press access to the international distress frequency. The buttons all feel solid and durable. After four years of use the buttons all still work and feel good to press, unlike some cheaper radios I’ve used in the past. 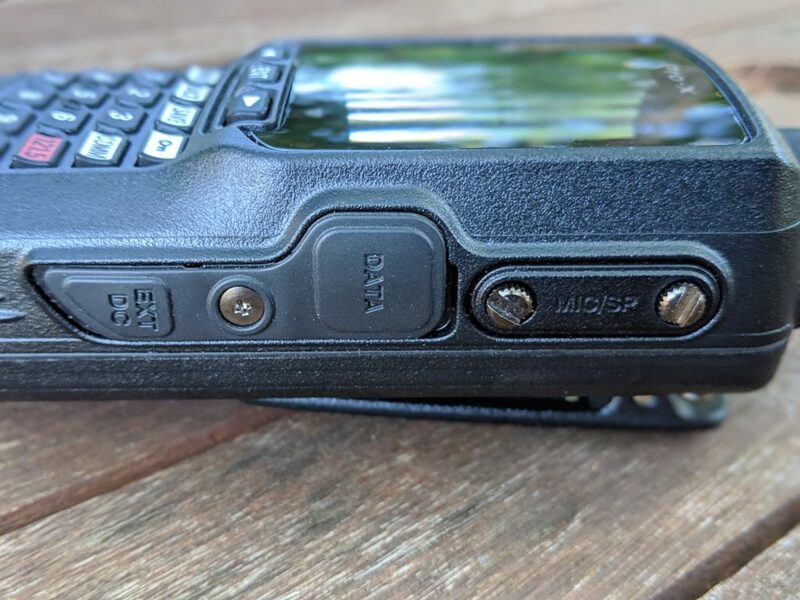 For those who want to dial the frequency directly there’s also a knob on the top that allows the user to tune the radio in 0.025 MHz increments. Above that once stood the volume adjustment knob, but four years in my bag means that the top knob has disappeared never to be found again. The radio still works, and the volume can be adjusted, but it’s more annoying without the knob. Just keep an eye on it. On the left side of the radio is the “Push To Talk” or PTT button, the power button, and the squelch adjustment button. The squelch can be adjusted by pushing the button and turning the frequency adjustment knob, while a scale on the display keeps track of the current level. It’s all pretty handy and feels solid in operation. On the other side are some handy ports. 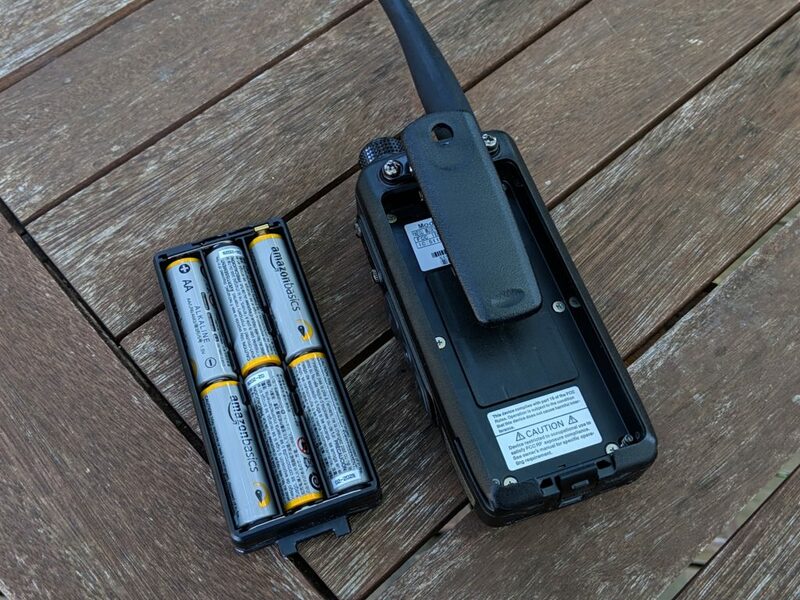 There’s a DC input for those who use the rechargeable battery, as well as a USB Mini-B port for programming the radio directly from your computer. The ports are protected by a flexible and water resistant cover that snaps into place. Just above that is a port that can be used to connect your standard aviation headset to the handheld radio. Included in the box is an adapter that converts from this port to standard aviation headset plugs and can be optionally attached. 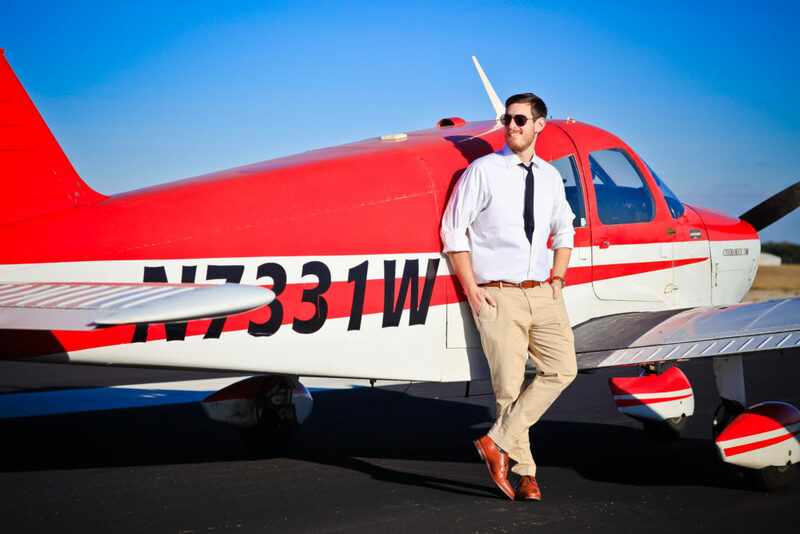 If you don’t that’s fine — it’s still loud enough to be heard in the cockpit of a Piper Cherokee even without a headset. Around the back there’s a belt clip that is attached to the back of the radio, and beneath that is a slide-in power tray that is held in place by a solid locking mechanism. The radio comes with a rechargeable battery for some models, but I selected the version that is powered by six AA batteries. In my opinion that was the smarter move, since it would enable me to use a readily available power source that can be quickly replaced from pretty much any store in the world. This may have been a poor choice in retrospect. In practice, this radio delivers on only about half of its promises. Using it as a scanner is perfectly fine. It can pick up air band transmissions about as well as the airplane’s radio can, letting me grab the ATIS before I start the engine and listen to other airplanes in the area. When I try to use it to talk to the tower things fall apart. From within the cockpit I can sometimes reach the tower, but only if it’s a small airport. I once tried to get my IFR clearance at Houston Hobby from the FBO about a mile from the tower and they could barely hear me from inside the cockpit. Another time I was flying back into Austin and wanted to try it from the air, but the tower couldn’t hear me despite being well within range for my normal aircraft radios. The radio claims a whopping five watts of peak envelope power, which is double the power of a typical FRS radio, but I’m not sure you actually ever get it. The double-A batteries don’t seem to be able to provide the necessary wattage for sustained communications. There’s one more thing that this radio does, and it does it wonderfully: navigation beacon tracking. The radio is able to identify and decode signals from VOR and localizer stations, allowing you to identify your position and track radials just like your normal single needle CDI NAV/COM radios. 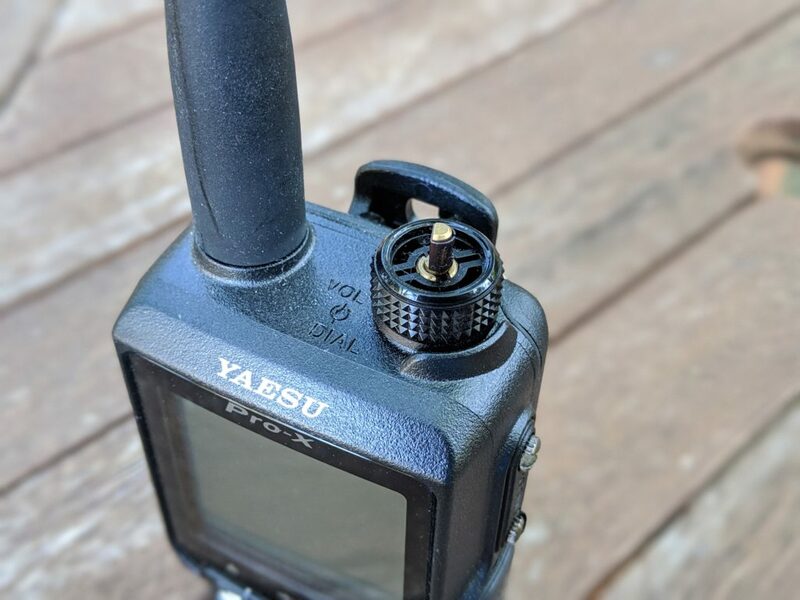 The visual display is clear and easy to read when tracking those navigational aids and provides a legitimately useful function in the event that all your radios become unusable. Just an FYI — that NAV aid tracking capability is NOT a standard feature on the lower priced Icom models. 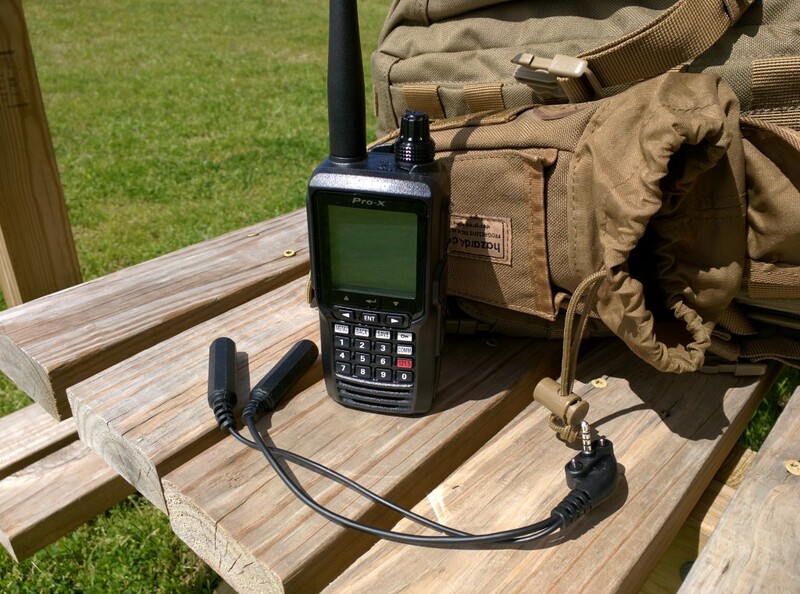 So you’re getting it here for way less than you’d expect with the Icom gear. This radio has some issues, specifically when trying to communicate over distances. It’s not that powerful with the AA battery pack. But it works over short distances, it’s great for listening in on what’s going on, and it works as a backup navigation aid if everything else fails. If the pilot in the AOPA video had brought one of these along with him things would have been very different. It’s not perfect, but it’s cost effective and still extremely useful. I’m happy with it. The radio doesn’t have a lot of range or power with the AA battery pack, but the price is definitely right. I’d recommend getting the rechargeable battery pack instead, which (if it works better) would definitely be a 4 out of 5.